This short yet exciting safari is a perfect opportunity to see the sprawling wildlife of Uganda in the famous Murchison Falls National Park. You will be enjoying game drives in this diverse park and also take a boat cruise on River Nile to the magnificent Murchinson Falls, which give the park its name. A trip to Ziwa Rhino Sanctuary to see the endangered rhino species is also included in your safari. Make most of your limited time by joining this diverse wildlife safari in nature's lap! Established in 1954, Paraa Safari Lodge is in Murchison Falls National Park. The lodge is located in the northwest of Uganda overlooking one of nature's best-kept secrets, the River Nile, on its journey from its source at Lake Victoria to join Lake Albert - here it is suddenly channeled into a gorge only six meters wide and cascades 43 meters below. Paraa Safari Lodge offers a unique blend of comfort, relaxation, and adventure. Each of the rooms is a haven of style and serenity, complete with balcony and private bathroom. For those seeking the ultimate comfort, the Queen’s cottage offers a different world of experience, novelty, and exclusivity. The unique architecture compliments the landscaped environment and fantastic views. The grand balcony does not disappoint, boasting spectacular views of lush vegetation and rich wildlife, as well as the famous river Nile. The rooms also offer an ultra-luxury master bedroom with king-sized bed, en-suite bathroom with shower and sunken bath, twin bedroom with en-suite bathroom, a large living or dining room, tea and coffee service, a large balcony, mini bar, and air-conditioning units. The lodge has three standard tents located a short walking distance from the main lodge building. These tents are perfect for those looking to have a more authentic ‘safari’ experience. Even so and once inside, the tents are superbly furnished with modern interiors and linens reflecting and creating a mood of being ‘in the wild’. Get closer to the river Nile and have some more intimacy. The tents offer en-suite private bathroom and shower, ceiling fans, and a private balcony with a magnificent view of the river Nile. Their standard single, double and twin rooms offer a simple safari atmosphere with a level of comfort that will not disappoint. These rooms are perfectly situated to view the lodge’s swimming pool, as well as the winding river Nile beyond. All rooms have balconies, fans, and en-suite bathroom. The suites are the perfect accommodation for guests who want a little bit more space to relax. They offer a living room with sofas where you can use the space to either relax or entertain. All suites come with fans, air conditioning units, en-suite bathroom, large windows offering panoramic views of the river Nile, and a mini bar to refresh yourselves after a long day out in the game park. The lodge has its own swimming pool, restaurant, business center, gift shop, conference facilities, and bar. After breakfast at your lodge, you will be picked up by your driver, who will transfer you to the Murchison Falls National Park on the northern side of the country. You will have a stop over at Ziwa Rhino Sanctuary for rhino-viewing. This animal is Uganda’s endangered animal which got extinct in the 1970s, when it was hunted by poachers looking for their horns as ivories. However, the government, with the help of some non-government organizations, started the breeding of rhinos at Ziwa Sanctuary for tourism and education purposes. After the visit you will proceed to have lunch in a Masindi Town and will reach the park in the evening. Overnight stay will be at Para Safari Lodge. 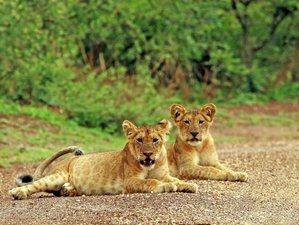 After an early morning breakfast, you will embark on a guided game drive on the northern side of the park, where you can expect to see a variety of wild animals like the hartebeest, elephants, oribis, African buffaloes, waterbucks, warthogs, Uganda kobs, leopards, and lions. You may also get to see birds like the eagles, griffons, Abyssynian ground hornbills, fiscals, piac pac, bustards, vultures, and many more. In the afternoon, you will return to the lodge for lunch and will then proceed for a boat ride to the bottom of the falls, here you can expect to see a great number of hippos and crocodiles, as well as other animals coming to drink water and a number of water birds. Not forgetting a good view of the mighty falls to complete the experience. Dinner and overnight stay will be at Para Safari Lodge. This is the last day of your safari and you will be dropped back to the airport. You will be visiting the Ziwa Rhino Sanctuary. You will also take a boat cruise in the Murchison Falls National Park during the safari. This safari will take place at the Murchison Falls National Park, Uganda. This park is Uganda’s largest national park and is a home for variety of animals and bird species, it is dived by the world’s longest mighty River Nile that flows through both the northern and the southern part. The park derives its name from the mighty river that forces itself into a narrow gap down the base, making it incredible to view these magnificent falls. The southern part of the national park is a woodland area and northern side a savannah area. During the safari, you will be served three daily meals. Please book your flight to arrive at Entebbe International Airport (EBB). Transfer from and to the airport is included. Tristar Africa Skimmer Safaris will pick you up from the airport. Tristar Africa Skimmer Safaris specializes in organizing off-the-beaten-track safaris in Uganda, Kenya, and Rwanda.